Kissing Crane Max Edge Ceramic Blade Chef Knife | BUDK.com - Knives & Swords At The Lowest Prices! Kissing Crane has jumped head first into the world of kitchen cutlery with its razor sharp Max Edge ZrO2 Ceramic blade chef's knife. The high quality 6" ceramic blade is honed to an edge not possible on steel. Every Max Edge ceramic knife meets strict quality standards before leaving the Kissing Crane factory. 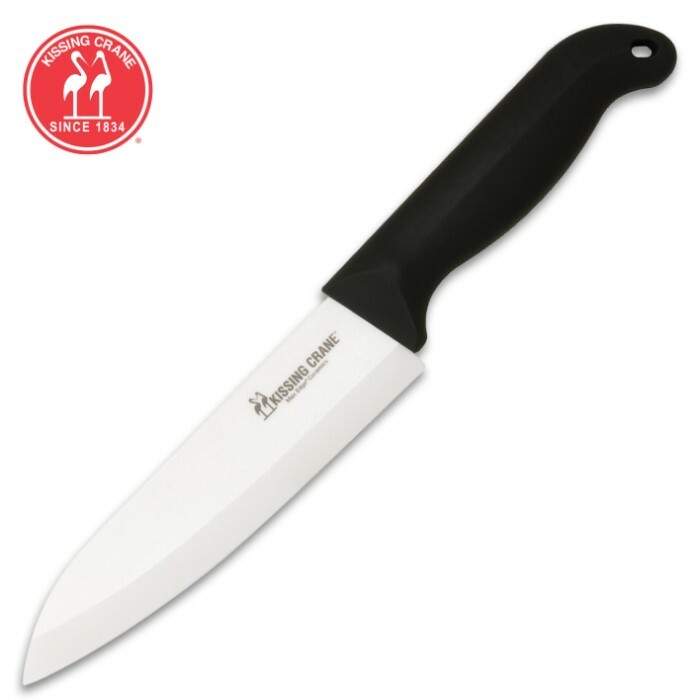 You won't find a higher quality kitchen knife at a better price anywhere. We have a few smaller ceramic knives and they are really impressive for slicing up fruit and veggies. This new one from Kissing Crane is really a well made piece. I thought the handle might be cheap hard plastic, but it is not. Nice feel and comfortable grip. You just need to remember these ceramic knives hold and edge, but do not try to use them to chop down on bones or other similar materials. By the way, the packaging from KC was very nicely done. BudK feel free to offer other sizes of the KC brand of ceramic cooking knives if they carry them. I got this for my wife who is a Breakfast Cook she loves it so much she uses it all the time. She recently cracked the handle of her first one cutting carrots so we ordered a new one. But we duct taped the handle on the old one and still use it at home.... great blade! Can't beat the price. We even ordered one for a coworker of hers after she borrowed it to use at work and wanted one of her own. It would be a great Christmas gift for anyone. After reading all of the 5-star reviews I really expected a nice knife. I have a few dogs and cut up meat for them on a regular basis. This knife is not up to the job and IS NOT very sharp! I guess it would cut through veggies pretty good but on meat like beef or chicken my 40-year-old knife inherited from my Mother does a much better job of cutting. I am a long time Kennesaw fan and buy a lot from them but this one was nothing more than a major disappointment. I have been a professional cook for 30+ years. Today I gave this knife a run in my kitchen for the first time. It passed every cooks test I could think of. For the price... I'm impressed with this knife. I will be stocking my kitchen with a few more of them. I've sharpened a few knives here and there at my job and this knife came Ultra sharp outta the box. A very nice knife for the money! You will not be dissapointed! I really have a thing about dull knives and ones that won't hold an edge. This thing is razor sharp and stays that way. I wish I would've tried one decades ago. We love it works great. use cutting apples and they don't turn brown before your finished eating. Knife is all that it professes to be. Awesome knife for the kitchen!! This is a great kitchen knife. We got a ceramic paring knife for Christmas 2013. We wanted a ceramic knife that was bigger but they are expensive. Bud K had a great deal on this knife and we jumped at it. 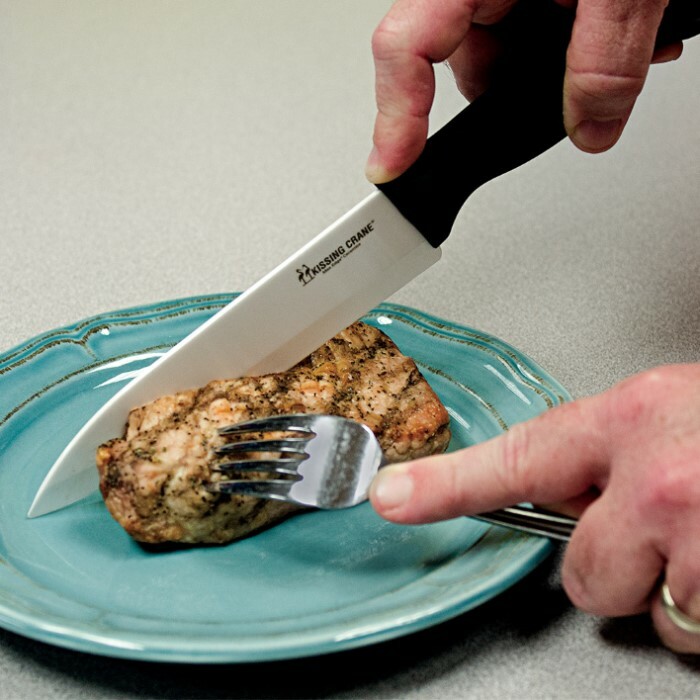 We have since used the knife and we love it! Great quality and very sharp. You will not be let down by this knife. very sharp light easy to use ,by far the best knife in the drawer love it love it buy this knife!!!!! !